I was completely unaware of Disney's soon-to-be most watched preschool series EVER, until a few weeks ago. While in a hotel room in San Antonio, Texas, I had the Disney Channel on for Riley while we were grabbing a bite to eat and freshening up. That's when I saw Jake and the Never Land Pirates for the first time. Riley seemed to enjoy every minute of the music-filled interactive treasure hunt and I have to admit that I quickly became a fan as well. If you and your children are Jake and the Never Land Pirates fans, keep reading to learn more about the upcoming holiday episode, and catch an exclusive sneak peek too! 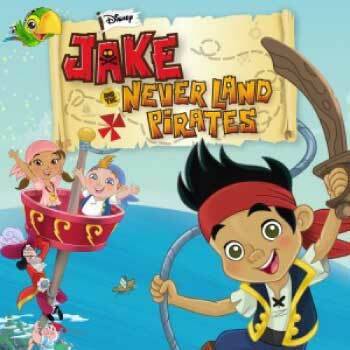 Jake and the Never Land Pirates series on Disney Junior introduces a crew of kid pirates, leader Jake and pals Izzy and Cubby, and follows their Never Land adventures as they work to outwit two infamous characters, the one and only Captain Hook and Mr. Smee, from Disney's classic "Peter Pan". Along the way, they model teamwork, problem-solving and physical activity, earning gold doubloons as they conquer a variety of tasks. The series features original "pirate rock" music performed by Sharky and Bones of The Never Land Pirate Band. In the holiday episode, It's a Winter Never Land! / Hook on Ice, Jake, Izzy and Cubby awake to find that Peter Pan has left the crew some presents and a tree to celebrate Winter Treasure Day, and Captain Hook invites Jake and the crew on a winter treasure hunt. Be sure to tune in for the holiday episode of Jake and the Never Land Pirates on Friday, December 2nd (8:30 - 9:00 AM Eastern) on the Disney Channel. And if you love the wholesome family programming from Disney Junior, specifically geared for younger children, you'll be thrilled to learn that Disney Junior will soon be launching a brand new standalone 24-hour Disney Junior channel in early 2012. Now, instead of the Disney Junior lineup ending at 2:00 pm Eastern, families will be able to enjoy Disney Junior any time of the day or night! So as you can see, Disney Junior has a lot in store for you and your children, beginning on December 2nd with the brand new holiday episode of Jake and the Never Land Pirates. If you and your family love this show too, make sure to tune in to "It's a Winter Never Land! / Hook on Ice" on Disney Junior and celebrate Winter Treasure Day with Jake and the whole gang! Disclosure: I received a Jake and the Never Land Pirates prize pack from Disney Junior and Team Mom in order to facilitate my review. No other compensation was received. This product review is based on my own personal experiences with this item and is completely honest and objective.